Al Brancato, shortstop for Philadelphia Athletics in the late 1930’s and early 1940’s, passed away Thursday June 14, 2012, at the age of 93 at an assisted-living facility in Granite Run, Pennsylvania. In 2008, I visited Brancato at his home in Upper Darby, where he graciously shared the details of his career over lunch at his dining room table. Growing up in South Philadelphia, it was on the sandlots where he cut his teeth playing against other professionals. Bolstered by his experience against these veteran players, Brancato caught the attention of the legendary Connie Mack and fulfilled every child’s dream of playing for their hometown team, when he signed with the Philadelphia Athletics for a $1,000 bonus while still a senior at Southern High School. Eager to make an impression during spring training, Brancato’s career was quickly derailed after a battle with the foul line. After recovering from his injury, he was sent to Class A in Williamsport, Pennsylvania, but the competition for the rookie proved too stiff. He only batted .160 in 25 at-bats and they sent him down to Class B Greenville, where he finished the 1938 season with a respectable .281 average. Ready to tackle a full year of competition in A ball, Brancato entered 1939 hoping to make good on last season’s failure. He stayed with the team all season, and responded by hitting .279 as their full-time third baseman. In an unexpected move, Brancato was called in September by Mack to join the team in Philadelphia. “He brought me up at the end of the season in 1939," he said. "I was just about 20. That was a big deal to be a hometown boy up that quick." Brancato played third base for the month of September while Mack tried out a variety of youngsters in the infield. 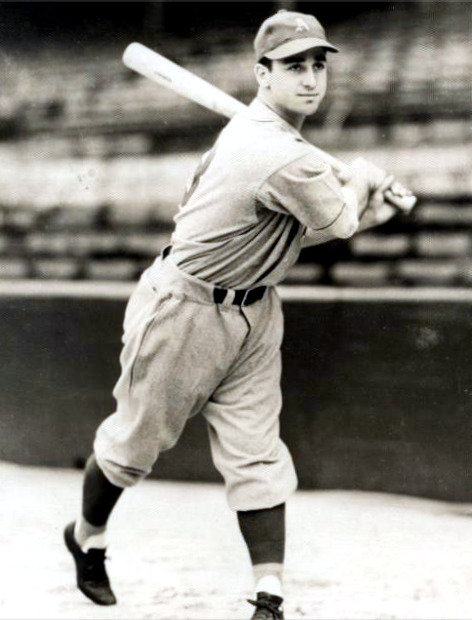 He put up a .206 average which included his first major league home run during the last game of the season against Washington Senators pitcher Joe Haynes. He stuck with the club the next two years and emerged as their starting shortstop in 1941. Given the chance to play regularly, Brancato had his best season at the plate, batting .234 in 530 at-bats. His fielding, however, needed work, as he committed 61 errors at shortstop. It is a single-season record that still stands today. Despite his troubles in the field, Brancato felt that he could match up with any other fielder in the majors. Nineteen-forty-one was also memorable for two other reasons, Joe DiMaggio’s 56-game hitting streak and Ted Williams’ batting record of .406. Williams entered the last day of the season with a .3995 average, which would have rounded up to .400 if he chose sit out the forthcoming doubleheader against Brancato’s Athletics. Williams wanted the mark with no questions asked and played in both games of the doubleheader. He responded by going six-for-eight in both games. Brancato was the starting third baseman in the second contest. Just as the 22-year-old Brancato was getting a toe-hold in the major leagues, his career was interrupted when he enlisted in the Navy shortly after the Pearl Harbor bombing. Rumors swirled that Brancato had a special deal that he would be assigned to a Navy supply store in Philadelphia so that he could continue to play for the Athletics. The Naval office in Philadelphia quickly refuted this idea, stating, "Brancato is going into the Navy to fight." Brancato saw active duty in the Pacific and was later part of a Navy baseball team that included Hall of Famers Bill Dickey, Johnny Mize, Pee Wee Reese. and Phil Rizzuto. He spent almost four years in the military and returned in time to join the Athletics at the end of the 1945 season. Brancato walked right into another historical occurrence during the 1946 season. Just as he was at the intersection of Ted Williams' record setting efforts a few years prior, his 1946 campaign put him up close with the tribulations Jackie Robinson faced in the minor leagues. Ironically, Brancato was traded in 1947 to the Dodgers AAA team in St. Paul. Robinson and his former teammate Reese would block whatever shot he had at returning to the major leagues. Despite putting up solid numbers, the call never came. He played eight more seasons in the minor leagues. His career came to an abrupt end in 1953 while serving as a player-manager in Elmira. Returning to Philadelphia, Brancato couldn’t shake his love for baseball. He worked at St. Josephs University as an assistant baseball coach under Jack Ramsay, who later was inducted into the NBA Hall of Fame for his basketball coaching exploits. After two seasons as an assistant, he took over the program for six years as the head coach. Brancato eventually settled into a quiet life in Delaware County and was a favorite at card shows, especially with the Philadelphia Athletics Historical Society. He remained a fan of the game, but acknowledged there are clear differences in game he played 70 years after his debut. “I still watch here and there," he said. "It’s a different kind of a game. Look at the size of them; they’re all 200-250. When I played, you had a few 6’2”- 6’3” guys, now everyone is. I was 180 when I played. I never saw so many big guys. Little guys like me wouldn’t have a chance today." While he acknowledged that some might dismiss his opinion as another disgruntled old timer, what he couldn't deny was the decline in fundamentals he saw on the field. Brancato’s passing represents a rapidly closing window of an era, as now only four major leaguers remain that played in the 1930s. The time spent with Brancato provided a peek into the major leagues prior to World War II. With the absence of an abundance of video footage from this era, only the stories remain to illustrate what baseball was like at the time. “You would really have to be back in my time to see the difference," he said.